A haircut can make all the difference–not just for the client but the barber as well. 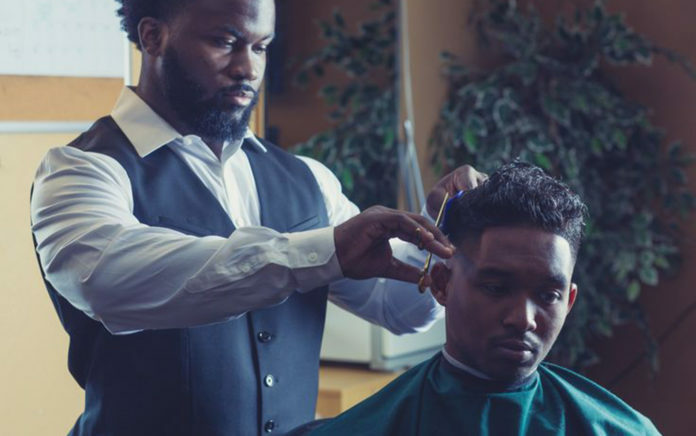 Ralph Cole, who goes by Ralph Cole The Barber, once found himself down and almost out, but he used his barbering skills to land back on his feet and now on top. Cole purchased his first pair of clippers in 2014, today he has a line of hair and beauty products in addition to his shop. He?s developed his very own hair, face, and body products. His newest release is a luxury line of grooming oil–Ralph?s Signature Beard Oil, which is vegan-friendly. Cole has also attracted an array of celebrities as clients, among them: NFL players Richard Sherman, Eddie Lacey, Shaquill Griffin, Sheldon Richardson, Bobby Wagner, and Tedric Thompson. Cole ?is a U.S Army veteran, who actually starting cutting the hair of fellow servicemen to supplement his income. In 2015 following his stint in the Army, he graduated from Olympia Barber School. But he soon found himself homeless and living out of his jeep for about two months. ?Well, close to the end of my military career in 2016 I saw that due to my injury, my years serving would be cut short and I will then become a disabled veteran. At this time all I had to fall back on being that I didn?t want to go back home to North Carolina, all I had was my clippers,? he recalls. ?I continued cutting hair in a barbershop while I was still in part time after I was done for that day from my military duties. When I was finally out of the military August 2016 I was then left homeless living in my Jeep. With nowhere else to go or no time to actually look for a job I still had to take care of my daughter and survive and pay bills so I just decided to put 120% into my barbering career.? Cole was determined to change his situation. ?I knew that I couldn?t stay in this state where I have no family and also had a daughter to take care of, so I took the time to tell myself that this is not where I want to be and God has a bigger and better plan for me. So I just made sure I was passing out my business cards every day, cutting clients from early in the morning till late at night till I got enough money to get my own apartment,? he says. And he decided he wanted to go into business for himself. Cole?s mother ran her own in-home salon, and now he was going to following in her footsteps and take his idea a bit larger. ?Growing up from a young age I always wanted to make and have money on my own. Growing up in a single parent home, I knew my mother wouldn?t always have leftover money for me to go and splurge with. I also saw how she too was doing hair on the side at the house for extra money after she would work double shifts a lot of times. I always had an entrepreneurial mindset but never was put in a situation where I had no other choice but to work for myself and couldn?t depend on someone else paying me,? he shares. With his line of products, it doesn’t seem like he will ever be dependant on someone else paying his salary. ?I had the great opportunity of being an educator and doing platform work for Clubman Pinaud and Woody. Two great men?s grooming product brands that gave me the chance to learn, network, and travel all over the nation. I was doing that for a year but then it got to the point where I saw that this company is making millions of dollars and I wasn?t seeing any of the money that we were out making for them,? Cole says. And he realized he could do his own line. ?So I just felt that If I could get on stage and teach about a product, sell a product, and see different ways on getting people interested in the brand itself, then I should just go and create my own product and push my own brand. That way in the long run I can build my own dream and cycle the money that I make from my work that I put in and have an empire to leave for my children and everyone that comes after me,? he explains. ?So as of January 2018, that?s when I resigned from working with the brands and went my own route starting off with my first product which is my very own Beard Oil.? Looking forward, Cole expects to be busy. ?This year has definitely been a roller coaster for me from day one. With me cutting some of the NFL?s best athletes, to starting my own product line, to opening my own studio as well. So I definitely have made a lot of major major moves this year already, but I still have a lot of work to do in all aspects,? he says. ?A few things that I am working on is my second product within my product line, I would like for that to be complete by December. I would like to have my grand opening of my studio after I get if fully decorated like I want it, I would definitely like to get out in the community more and share my story to motivate people and show them that no matter what your situation is, you can make it out and be the best you that you can be. I would also like to do many many more interviews and just try to reach more people and continues to grow my brand and continue to learn how to be a better person, a better barber, a new business owner, a better entrepreneur.? ?Being able to create an experience for my clients that they will not find anywhere else for a price that is worth paying. I tell people and my clients that I don?t sell haircuts because you can get a haircut from anywhere and anybody. I want my clients to know that when they book an appointment with me, they?re not making a payment, they are making an investment into there well being. Not only are they getting a great quality haircut when they come, but they are also getting groomed in which most men never received before as a barbershop. ?